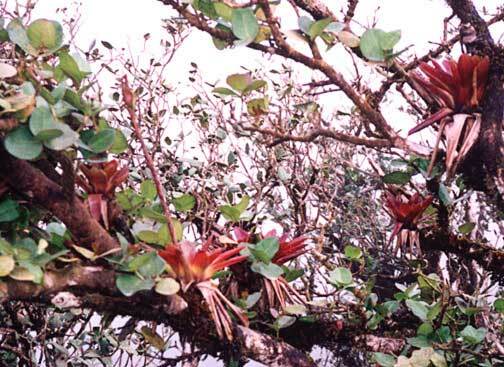 The dwarf forest ( also called the cloud or elfin forest) lies at the very top of the mountain peaks along the ridges and receives, not only the most rain, but also the most wind. The soil is very thin due to constant rainfall erosion and the roots of the plants must spread out in a matrix over the ground, rather than grow down into a soil, which is not there. 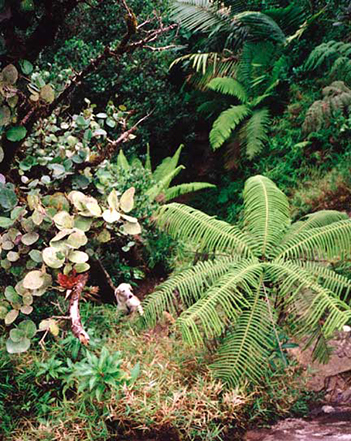 The plants that do manage to survive these harsh conditions are different than the species of plants a little further down in elevation. Trees are stunted or 'dwarfed' due to the wind and a small tree in the dwarf forest can be very old. 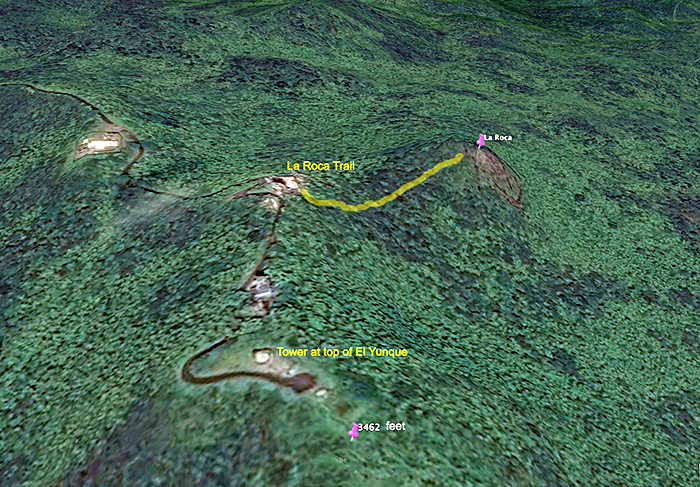 Group tours do not access the dwarf forest because it is an additional 2 hour hike above Mt. Britton. Plan to hike up on your own, if you start early in the day. You should carry a rain jacket, it can get cold and wet. The trail to La Roca starts by the cyclone fence behind a utility building. Climb the rock at the end of the short trail, amazing view. (don't fall off!) A 'once in a lifetime' experience through the dwarf forest! The little path to Mt. 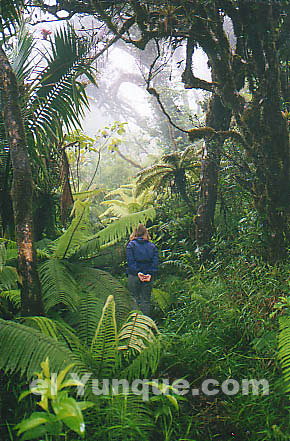 Britton does have some of the characteristics of the dwarf or cloud forest, so the 45 minute hike up to Mt. Britton from the parking does offer a glimpse of this uniquely dwarfed vegetation. • MT. Britton Tower is a favorite hiking trail with the tower destination and views over the mountains tops. 45 minutes up from the parking at the top of road #191. Sunny days you can see forever, cloudy days the clouds swirl around and below you! • Visitors Center The El Portal Visitors Center is closed. Visit 'El Portalito' in the gateway town of Palmer for exibits and information.